Spring/Summer 2012 shows happened a few months back and were not the most impressive or striking in my eyes. There weren't very many new and exciting trends compared to last years s/s shows. Most of the trends I found were ultimately carried on from the fall/winter 2011 shows. Nevertheless, I am a big fan of the current summer looks and have compiled a list of my favourites! Such an easy way to feel fresh and stylish when the days are hot and sunny. When pairing whites, it is crucial to look at the shades of both pieces in different light- a more stark and vivid white will not pair well with a more beige toned soft white! A very popular dress trend with a very new and flowy feel. Light chiffon fabrics makes this dress ideal for those windy days when you want to make a statement with your dress fluttering behind you. The oh-so-popular lace dress is very easy to find, but easy to mess up also. Tight, sheer white lace dresses can look like bed-time attire and will put a big trashy stamp on the outfit. 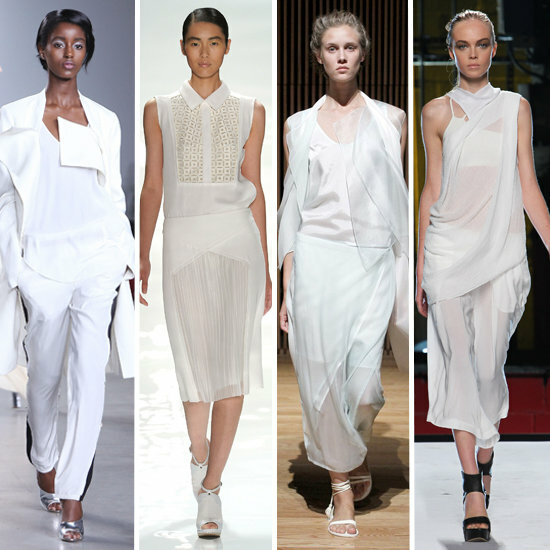 A loose fitting or tailored dress with good coverage around the lady bits will look both classy, and fashion forward. Maxi dresses need minimal explanation. They can be found in literally every colour, style and pattern imaginable. This is a tough one. There is a very fine line between showing too much, and showing just enough. My motto is only highlighting one feature and leaving the rest to the imagination. Therefore, if one decides to wear a sheer button down with a visible bra underneath, pants, shorts with good coverage or a longer skirt should be worn so that the outfit remains appropriate and comfortable. The issues arise when, for example, a tight see-through tank is worn with a hot pink push-up bra and a barely there spandex mini-skirt. Not the ideal route, but unfortunately the one that is often taken. I can confidently say this is one of the most popular colours of the year. Mint is popping up everywhere and is such a flattering colour on every skin tone. It can be worn daily or be dressed up for a summer night. The most popular mint pieces are button down shirts in chiffon materials and summer dresses. Personally, I don't feel as if the peplum trend will last very long but it is definitely a fun silhouette to play around with. It is the ideal way to highlight the waist and create the illusion (or emphasize, for the more fortunate) of a very thin waist and larger hips. It is seen frequently in skirts and formfitting shirts. I am not a huge fan of both of these trends and do not have adequate pieces to show them in my own fashion looks, but they do deserve an honourable mention. Neon accessories are very popular this season and are a very easy way to add a punch of colour to a simple look. Tangerine was labelled the colour of the year by Pantone Universe (the ultimate voice of colour) which still did not change my opinion about the colour itself. I am not a huge fan of the warm spectrum, consisting of yellow, orange, red and brown. I do, in fact, LOVE red, but it has to be a very true cherry red. No hint of orange or brown. Brown is a great colour but only for leather items. So nice! I love the all white and mint looks the most:) Great post and very well thought out!